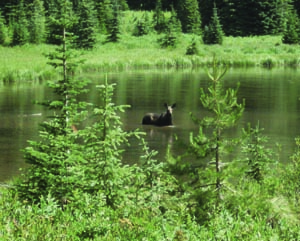 In the southeast corner of the Clearwater National Forest spreads 23,000 acres that make up Sneakfoot Meadows Roadless Area (also known as Elk Summit, in conjunction with the adjacent North Fork Spruce Roadless Area). This complex country os bounded to the west by the sharp mountains of the Selway – Bitterroot Wilderness, Lochsa Face Roadless Area to the northwest, and North Fork Spruce Roadless Area from the east. As its name suggests, it is dominantly composed of gently rolling terrain, high water tables, and wet meadows with lazily meandering streams. One can however, climb to elevations over 6,000 feet with the promise of a strikingly cold, crystalline lake (there are five in the area) tucked in a glacial cirque basin. The ragged peaks average around 7,000 feet; the highest is just under 8,000. The generally lofty elevation translates to nearly 90% western spruce-fir ecosystem coverage, largely subalpine fir, grand fir, Engelmann spruce, and even-aged lodgepole pine rising from the ashes of widespread fires in the early 1900s. Shrub areas are dense with alder and willow in the wetter lands, and menziesia—“fool’s huckleberry”—provides fodder for elk, deer, small game, and moose. 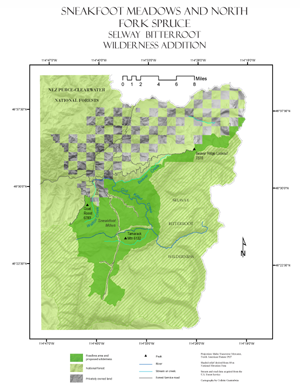 A 2,000-acre Research Natural Area sits within the boundaries of this country focused on the unique wet meadows, surrounding subalpine fir habitat, and ancient Engelmann spruce stand. Lush stretches of marshy meadows peppered with lupine, Indian paintbrush, and clumps of slender trees giving way to steep slopes and rocky pinnacles create a prime homeland for many species of wildlife. Elk graze the higher elevations in the summer, and mule deer, black bear, and numerous common forest species cohabitate. Of particular interest is the Elk Summit moose herd, likely the largest concentrated moose population in northern Idaho. Because so little is known of the habitat requirements for this unique animal, studies are being conducted through tagging, radio collaring, and observing animal behavior during different seasons of the year. These lanky creatures are readily observed during the summer months throughout the area, especially near the meadow areas and along the roads. In addition, fisher, wolverine, and Region 1 sensitive amphibian habitats overlap Sneakfoot Meadows Roadless Area. The streams are a fundamental native fish habitat for the likes of Westslope – cutthroat and inland redband trout, and principal spawning and rearing waters for steelhead and Summer Chinook. The two Walton Lakes are popular with anglers, and the streams provide high quality water to the larger White Sand Creek. A mere half-mile into the corridor screens noise from the access roads, and the explorer is free to peruse the lattice of low-standard trails in seclusion. One might briefly encounter other hikers or horseback riders, as Sneakfoot Meadows provides a stunning landscape for primitive recreation and drinking in the scenic and wildlife views. Wintertime snowmobile use disturbs and diminishes critical lynx habitat; as a natural segue to the Selway – Bitterroot Wilderness and bordered by other substantial roadless areas, it is critical that Sneakfoot Meadows receives protection to maintain its remarkable natural integrity.